Congratulations to Isabella Greinke. Isabella is the recipient of a $1000 scholarship on behalf of Bonnie Plants. 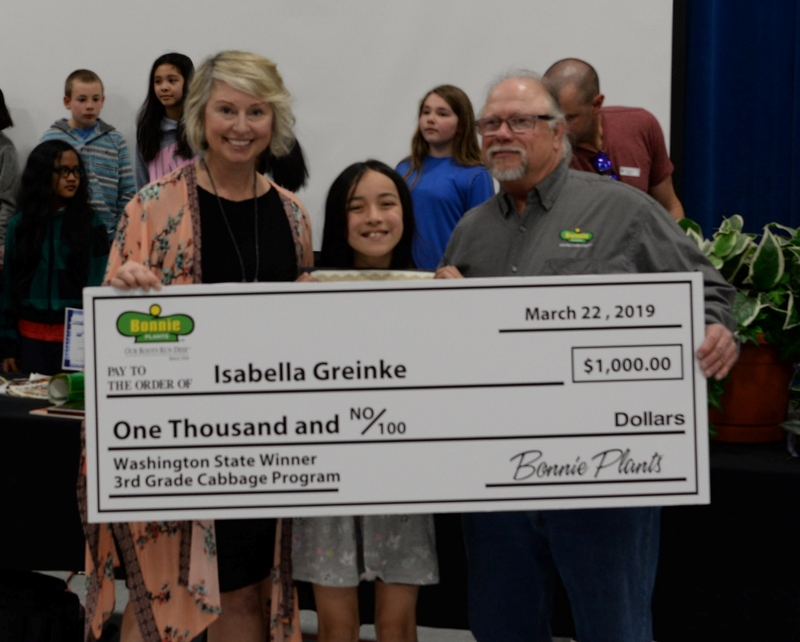 During an Excellent Eagles assembly at Woodland Elementary, Isabella was surprised when she was announced as the 2017-18 Washington State Bonnie Plants 3rd Grade Cabbage Program winner. Last year was the first year Woodland students participated in the cabbage growing program. The program was created by Bonnie Plants with the intent to inspire young people to have an interest in agriculture. Students were instructed to grow and care for their plant at home over the summer and take pictures of their potential prize-winning cabbage to submit for the contest. The program provides more than one million free cabbage plants to classrooms across the United States. Students cultivate, nurture, and grow their cabbages while learning the basics of gardening, the importance of our food systems, and growing their own food. At the end of the season, teachers from the participating classes select the student who has grown the “best” cabbage based on size and appearance. The student’s name is entered in a random statewide drawing. State winners then are randomly selected by the Commission of Agriculture. Congratulations again to Isabella Greinke.